A Catholic bishop had to be hospitalised after a group of parishioners attacked him, a security guard and a priest in a five-decades-old land dispute in the southern Indian state of Tamil Nadu. Source: ucanews.com. Salesian Bishop Jerome Dhas Varuvel of Kuzhithurai left hospital on Tuesday, two days after he was attacked by a crowd of about 130 Catholic men and women. The guard remains in hospital after suffering serious injuries in his attempt to protect the bishop, diocesan chancellor Fr Russel Raj told ucanews.com. Fr Augustine Ponnaian, the diocesan financial administrator, suffered minor injuries and was not hospitalised. Police have arrested two persons and are looking for the other 56, who are reportedly hiding to avoid arrest. “It was a planned attack on the bishop,” Fr Ponnaian said. “As the bishop tried to move ahead, one of them pulled him from behind. And when I tried to save the bishop from falling, the man slapped my face,” said Fr Ponnaian. The guard intervened and tried to protect the bishop. “But the people attacked him so much so that he sustained injuries all over his body and even one of his legs sustained cracks,” the priest said. The land dispute goes back to 1965 when Kuzhithurai Diocese, created only four years ago, was part of Kottar Diocese. Catholics in two parishes disputed ownership of a piece of land in Appattuvilai village. 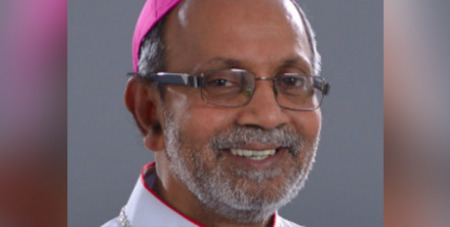 Bishop Varuvel, 67, issued a decree on May 5, 2018, settling the dispute between St Antony Church and St Joseph Church. Some St Antony parishioners claimed the settlement favoured St Joseph’s and refused to accept it. They wanted the bishop to withdraw the decree. Father Raj said the bishop’s decision followed recommendations of a committee including lawyers, eminent persons and seven representatives of each parish.